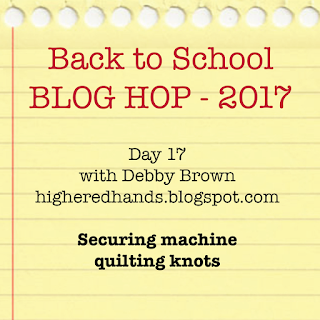 Sam Hunter is running a fabulous Back to School Blog Hop for Sewists and I'm honored to share some machine quilting tips today. 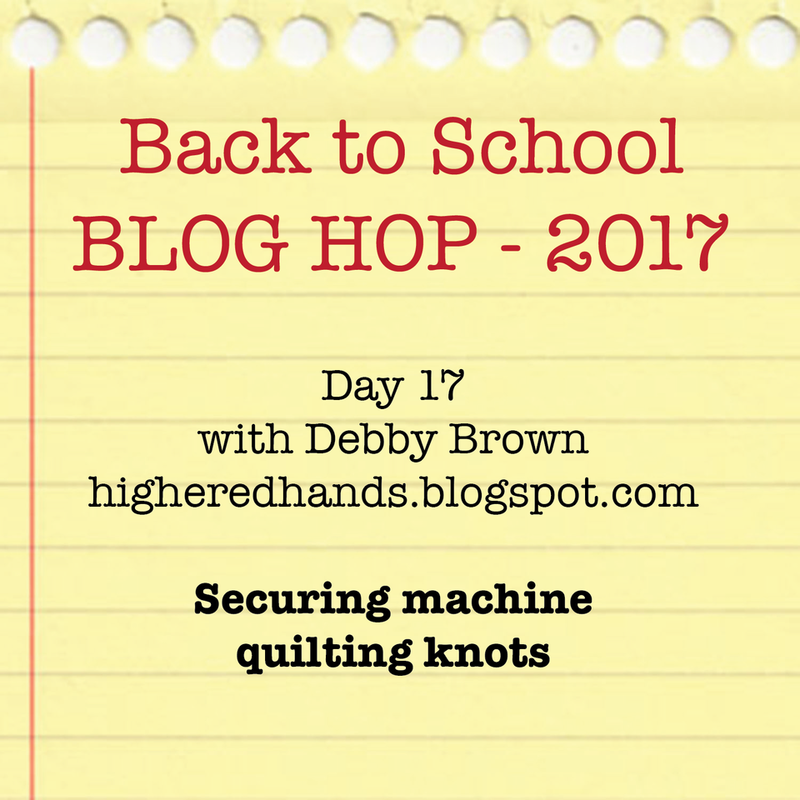 Securing machine quilting knots is one of the most-often asked questions in my classes, so I thought I'd show you how as part of this blog hop. I offer more tips like these in my newsletter, so sign up here! Be sure to catch up on your lessons and follow along with the rest of the blog hop! While I was in England a few weeks ago, Super-Hubby and I took a quick trip to Paris. I've been to Paris a few times, but I've never left the airport so it hardly counts. The goal of this trip was to have fun, but to not wear me out physically as many European trips can. Super-Hubby booked a hotel a few blocks away from the Louvre since that was a must-see for us. It was a risky choice of hotel, but the location and price were right. We stayed at the Hotel Odyssey, a concept hotel based on Ora-Ito design concepts. This hotel room made cruise ship cabins look large. Seriously. But it was PERFECT! There are only 29 rooms in this hotel, and "they decline 29 tones of the chromatic scale" which means they were each different vibrant colors. Our room was purplish. Walking in the room, my first thought was "Where is the toilet???" Was it in the hallway? Running out of places to look, I opened the closet behind the door. There it was! This bathroom made airplane bathrooms feel spacious. I have enough hours in the air to state that with complete authority. The website doesn't hide the smallness of the rooms. It states "The very functional space is structured around very few things; everything is at arm's length." They were completely not kidding, and it completely worked! Everything was small and it was comfortable. I have stayed at luxurious hotels, scary hotels, homeless hotel (NOT PLURAL), and many others, but this was the oddest hotel I've ever stayed at and it made Paris even more memorable for us. Do you have a weird hotel experience like this that ended up being perfectly lovely? Along with many, I am glued to the news watching the devastation in Texas. If I were home, I would turn off the news, run to my sewing room, and make postcards to bring peace to myself and to others, but I am traveling this week with my family. I have no machine or fabric and not even a single thread with me. I wrote up this pattern and have added it to my store. If you look closely, you'll see that the downloadable pattern sells for $0. In exchange for this pattern download, I ask that you make a donation to the victims of Hurricane Harvey. I have friends who work with Samaritan's Purse; please add links to your favorite relief charities in the comments below. When I return home, I will stitch this and publish tutorials in my newsletter. You can easily make postcards from the scraps in your sewing room. If you need supplies, though, check out my Postcard Trimming Tool and Postcard Supply Kit on my website. Please share this post wherever you can. I recently taught Simply Sixteen classes in the Pinhole Quilting stand at the Festival of Quilts in Birmingham, UK. Due to a packed schedule and limited internet access, I couldn't show you all of the wonders of this trip in real time. Please enjoy some delayed posts about a FABULOUS trip! When I was in Birmingham, Super-Hubby and I stayed at a beautiful bed and breakfast in Hampton in Arden. I want this wainscoating in my house! Why can't I be served breakfast here EVERY DAY? Did I mention charming touches? So, my time at the show was wonderful but my time away from the show was wonderful, too! Are you jealous of my job? Because I'm pretty sure I have the best job in the whole world! Since I travel for work about 50% of my life, I like my time at home to be as simple as possible. I have already mentioned my simple laundry routine, but other cleaning chores could take up all of my time at home, leaving no time for quilting. The horror! Years and years ago, I ready Flylady's book (affiliate link*) and learned that a little cleaning done regularly can keep the house pretty clean. I've adapted her system to work with my traveling life and cleaning wipes are my answer. I use cleaning wipes to keep my sewing room clean as well as the rest of the house. I can't breathe when I use harsh chemicals, so I make my own wipes. I cut up old towels from my wedding shower (30+ years ago) and zig-zag stitched around them. If none of your towels look like my old towels, I suppose you could buy cheap washcloths instead. I cut them to the size of my Swiffer so that I can use these to mop my floor as well as wipe grimy surfaces. I store the wipes in plastic containers and then cover them with this home-made cleaning solution. I keep a container of wipes in the kitchen, each bathroom, the laundry room, and the sewing room so that I can have them at hand whenever I need them. When the tables on my longarms get dusty, I grab a damp rag and wipe the dust off. When my floor mats (affiliate link*) get dusty and grimy, I put a damp rag in my Swiffer and do a quick mopping. This prevents the grime from the mats getting onto any fabric that might fall on it. I use these same cleaners for the rest of the house. Warning: this cleaner dries with streaks/spots, so I wipe surfaces down with a dry towel. Whenever I'm in between steps of a sewing project, I grab a wipe and clean something quickly so that I can get back to quilting as soon as possible! *An affiliate link means that if you click on the link and buy the product I may, at no additional cost to you, receive a small commission to help keep this blog running. **My vodka is in a Mason jar because the lid broke on the vodka bottle. I promise that I didn't make my own hooch. Yesterday I wasn't at peace. It wasn't the injustice in the world or interpersonal relationships that had me disturbed, it was an IV bag of steroids I received as part of a routine medical treatment (full store HERE). If you've never been treated with high dose IV steroids, you might not be able to appreciate the jumpiness, shakiness, sleeplessness, pent-up energy, and emotions that come with it. Even though I do my best to keep to myself, I apologize to my husband for my behavior before, during, and after treatment. I was pacing in circles yesterday, unsettled, so I decided to make a postcard. I hoped that focusing on a small project would give me a little peace. It did! This card is already in an envelope and on the way to a friend who will appreciate a disco ball of her very own. While I was at Festival of Quilts in Birmingham this month, I took some extra time and headed to Paris. This sparked a new postcard for Little Boy. I'm home this week, planning more postcards for Little Boy. I'll finish the alphabet and then figure out my next series of weekly surprises in the mail. Follow along on my trip to Festival of Quilts in Birmingham, UK. This show was completely busy, as in "no time for restroom breaks or lunch" busy. I saw very few quilts but I saw thousands upon thousands of quilters, so it evens out. Victoria Findlay Wolfe thinks that it is her quilt but I quilted this quilt for her and it's my blog, so its my quilt! Our quilt has traveled the world and been published in this book (affiliate link*). Most shows have a theme. The theme of this show, for me at least, was chocolate. Yes, I'm horrible at taking selfies. I'll likely never improve. Although not shown in the photo, Janet also gave me chocolate and told me that I had to look up the commercial for this treat. to return here another year! Stay tuned, though, because my trip didn't end with the Festival of Quilts. More later! *If you purchase something through an affiliate link I may, at no additional charge to you, receive a small commission to keep this blog running. I recently received donations of dishes from folks who got married in the 60s. Does it show? Helpful hint from this machine quilting professional: properly install your walking foot else your quilting will look all bumpy and uneven from forcing the fabric through the machine (see center of spiral above). If I can't be a good example, at least I can serve as a cautionary tale. I left the icky quilting because I'm giving these placemats to my mother-in-law and they will soon be covered in spaghetti sauce. Note: I think I'm in love with Wonder Clips. Seriously. Seriously, isn't this the cutest placemat you've ever seen? I hope my mother-in-law enjoys these! My friend is going through a medical ordeal and I wanted to let her know that I love her and haven't forgotten about her. She loves black and white and pink and polka dots. I thought FabuLux Cloudy Skies and FabuLux In the Pinks were perfect for her and that this card represented some of her favorite things. I started my love affair with the walking foot when I read Pat Sloan's Teach Me to Machine Quilt book (affiliate*). I've never played much with my walking foot, but her book has inspired me to do so. I love trying new things and these postcards give me a small, risk-free project for experimentation. Have you tried making postcards? I have kits of stabilizer and envelopes and also a Postcard Trimming Tool in my shop to help you on your journey. *Affiliate links mean that if you purchase through this link I may, at no additional cost to you, earn a small commission to help keep this blog running. I'm taking break from mailing Little Boy the alphabet postcards. Instead, I'm mailing him a travel postcard! I was at Festival of Quilts in Birmingham last week so I sent Little Boy a postcard of the flag of England. I will resume the alphabet cards once I return home. I have no idea where this quilt will find its forever home, but I think I'm going to enjoy keeping it as a sample until then. I experiment with many quilting techniques when I make my Postcards for Peace. Since these are experiments, I use mostly fabric scraps. This way I'm willing to take risks without worrying about 'ruining' good fabric. When I'm adding machine quilting texture to my postcards, I use a thin batting, typically Quilter's Dream Angel (affiliate link). I have an abundance of scraps of this flame retardant batting since I am making many, Many, MANY baby quilts during this season of my life. I trim the batting with a straight edge and stitch it together on my HQ Stitch 710 machine. To keep the seam from showing through the project, I use WonderFil DecoBob thread in both top and bobbin. This is an 80-weight polyester thread. It's strong but thin and doesn't make the seam bulky. I've tried many different stitches, but I currently use a triple-stitch zig-zag stitch to join the batting pieces. I prefer a 7mm stitch width and a 1mm stitch length. 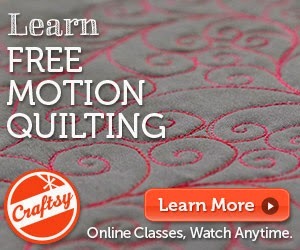 As a decades-long machine quilter, I have never been a fan of an automatic thread cutter. Well, my beloved HQ Stitch 710 machine came with this feature. I tried it for when I join strips of batting and Oh. My. Heck. How I love this! I will still not use it for machine quilting, but it's great for piecing batting. Once the batting is pieced and cut to a sized that fits my postcard project, I layer it with the top fabric. I then machine quilt without any backing since this piece will be trimmed and fused to postcard stabilizer, edge-stitched, and then sent out into the world with love. Do you think about the cost of your supplies when you are experimenting? Will using scraps make you more willing to take risks?